Dale M. Lappi passed away August 14, 2018 in Casper, Wy. He was born April 18, 1955 in Virginia, MN to Ronald and Barbara Lappi. He was the 2nd of their 6 children. He was raised in Butte, MT and after graduation joined the army. After leaving the army he traveled around and worked in many states. He loved to travel and was known to go where the highway and life took him. He met and married Jackie Hanson and their family was complete with the birth of Ireana Joy. After divorcing, Dale moved around a little until settling back in Casper. He loved to fish, hunt and walk in the mountains looking for arrowheads and other treasures. He loved football, The Vikings. He was a quiet man, easy going with a wandering soul. 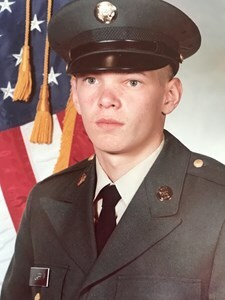 He is preceded in death by his parents and is survived by his daughter Ireana (Dakota Harris) and granddaughter Alice Harris, brothers Jerry and Tom, sisters Connie, Chris, and Karen (Rod Bisbee), numerous nieces and nephews. We will all miss that grin and the way he chuckled when something was funny. After cremation he will be placed in the VA cemetery in Mills, WY where his father rests. A service to honor his memory will be at a later date. Add your memories to the guest book of Dale Lappi.